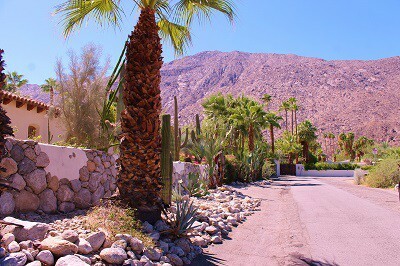 Palm Springs, California, nestled at the base of the Mount San Jacinto Mountains, is the western gateway to the Coachella Valley. Many people refer to Palm Springs as “The Golf Capital”, when in reality our Valley’s 120 + courses are scattered throughout our 9 Valley cities. Our Westerly city of Palm Springs is currently enjoying a rebirth of sorts. Established as a center for Mid-century Modern Architecture, many of our local homes that were built in the 1940’s, 50’s and 60’s, are being renovated and sold to a much younger, hip clientele. Often, these new buyers are from L. A., or one of our nearby Beach Cities, and are realizing that at the end of a short, 2 hour drive, lies the warm, welcoming charm of the Palm Springs lifestyle. Rich in History, Palm Springs has been home to some of Hollywood’s best known stars over the years, which explains its nickname of “Desert Playground to the Stars.” Former Mayor Sonny Bono, introduced the Palm Springs International Film Festival to our valley. This festival has become a world class event, drawing thousands of people to the desert valley every January. We also offer an LGBT Film Festival, the White Party, Farmers’ Market every Thursday evening during the season, and multiple art districts, including the Back Street Art District. The palm tree lined streets of Palm Springs, offer up boutique shopping, fine dining, art galleries, the Palm Springs Art Museum and multiple Exotic music and dancing venues. The Indian Canyons offer hiking, horseback riding and exploring on the ancient grounds of the Agua Caliente Band of Cahuilla Indians. There is gaming at the casinos, swimming, tennis, Villagefest every Thursday night and the Tour de Palm Springs for biking. Let’s not forget the Palm Springs Aerial Tramway where you can soar 8,000 feet up to the top of Mt. San Jacinto to escape the summer heat, engage in winter sports such as cross country skiing in the winter, or just enjoy the views. The City of Palm Springs offers excellent public and private school opportunities for grades K-12. The public schools are under the jurisdiction of Palm Springs Unified School District. The College of the Desert and the combined campuses of CA State University – San Bernadino and University of CA – Riverside are nearby, making quality higher education opportunities readily available.